It takes a true Mainer to know the town in which Sally grew up: Norway. It’s small (pop. 4,979), it’s not on the coast, and it’s not notable for any particular natural landmark. Sally’s sister lives in nearby Poland, whence the mineral water Poland Springs flows, and people sometimes recognize it, but rarely Norway. Thus it was big news when, two years ago, a couple announced plans to open a brewery there. This past Sunday, on our biennial Thanksgiving visit to see Sally’s family, we stopped in for a bite. Human experience requires constant recalibration, and mine occurred about halfway through my dry-hopped pilsner, Impersonator. I was focused on the overly American hop character and lack of assertive malt flavor when it hit me: I am in a brewpub in Norway, Maine. My critical apparatus had been set to “world standards.” I quickly recalibrated to “18-month-old brewpub in rural Maine,” and all of a sudden it was looking mighty impressive. There were no flaws in that or any beers we tried, and part of my complaint was, admittedly, preference (I don’t want to taste IPA in my pilsner). Things for more impressive from there. A Berliner weisse made with all-Maine ingredients was on the menu (quite credible, if lacking the depth provided by Brettanomyces in the best examples of the cool, fair maidens). I asked our young server about it and she gave me a full and complete account of the beer, including brewing method (kettle-soured). Bigly impressive! Most of the crew ordered Mr Grumpypants (oatmeal stout), as they are a dark ale family, and the server explained the background to the name there, as well, involving an actual pair of pants the owner, remarkably from the actual country of Norway, owns. Also a very nice beer. Finding a brewery of this quality in rural Maine is not historically typical. To use a contrasting example, take Bavaria, home to several hundred breweries and arguably the spiritual center of the beer world. We are not supposed to disparage Bavaria or the little hausbraueries located in every village there. But it remains a hard truth that a lot of them don’t make great beer. Stopping into a local for lunch is a crapshoot. I fell in love with German brewing in Bavaria and Franconia, and German malts, and German helles bier, but I was routinely disappointed by mediocre or even poor beer. Some breweries even make helleses with—it pains me to write this—off-flavors. I don’t make an effort to point this out because so many of the breweries, including many in remote towns, make such exceptional beer. But in the Bavarian equivalent of Norway, Maine, you take your chances. There are bad breweries in America. Of course. And remote places still don’t have reliably excellent breweries like Norway. But as I was doing my recalibration, I considered a local chain here in Oregon as a benchmark. The McMenamins have been making B-/C+ beer (with occasional outliers in either direction) for three decades. It’s fine. No one walks away grumbling—nor singing its praises. The McMenamins are and have always been about the precise average for breweries, a gambler’s over/under and a good standard for judgment. (It has steadily crept up in quality to match the industry’s ascent, but somehow stays exactly middling.) 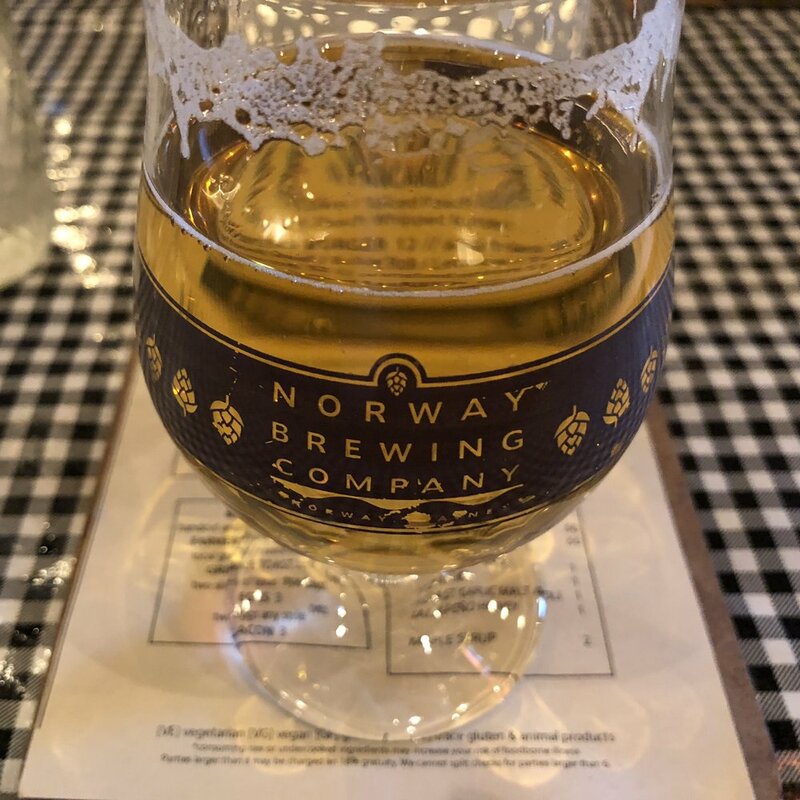 Norway Brewing? Way better than McMenamins. I didn’t even mention the food, which is the main reason the place was packed when we showed up. It’s clever, unusual, and very good—better than the food in 90% of Portland (Oregon’s) brewpubs. They’re doing mixed fermentation beers, and the server apologized that their most recent release had blown so quickly (it was available in bottles, for a mere $12). Across the board, it was an impressive place, particularly given that it hadn’t been open the last time we were there. And what’s most remarkable is that this isn’t even that remarkable anymore. That’s how good beer in America has become.